While I was at the height of my writing career, I had columns about music in several magazines. That was in the mid nineties, when there was still a lot of music to be discovered, which made writing a few columns pretty easy. And much fun. I had a long list in my head of music that I had only heard or read about. This was in the pre-mp3-era. Most of my fellow record collectors had even longer lists of records that they wanted to hear or buy. That gave my the idea to write a column only about records that I had never heard yet. I wanted to illustrate the stories about the records on my want list with vague photocopies and citations from articles about these records in obscure zines,that made me aware of their existence in the fiorst place. I really loved to see thumbnail photocopies of LP covers and to read about records that i didn’t knew to exist,and I thought that there must be more people getting warm feelings from stuff like that. Those days are over. 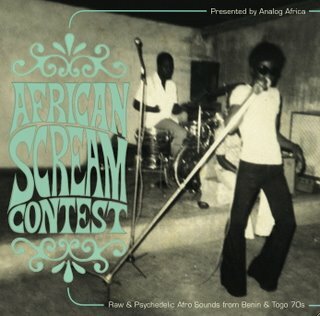 Today I got a mail about a recent CD compilation ( African Scream Contest) and thank to the link could immediately see a full colour cover, a complete list of all the songs, I could read several background stories, and I could even hear some songs that are not on the CD. The guy who made the CD even published a 42 minutes mix of music that did not end up on the CD, and made it available for download on his blog ! I don’t follow African music. The main reason is that there is simply too much music. But after reading the blog and listening to the mix, I can’t wait till I get the chance to go downtown and buy African Scream Contest . There are people who don’t like the way Internet changed record collecting: it put an end to a lot of the hunting and searching for records. I don’t mind that at all. I rather have somebody else do all the work and make me a CD with the highlights of his or her collection, than having to spend my precious time and money, only to add two or three scratchy original 45’s to my shelves, in a genre that isn’t mine anyway. There is still so much music not unearthed yet! I think it is better if everybody stuck to his or her own specific territory. 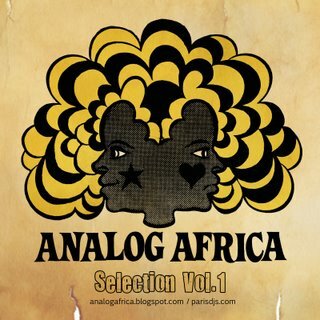 I must say that listening to the Analog Africa mix makes me very excited: I have not heard such a great compilation of unknown music in a long time! Hard to imagine that the CD is going to be even better. exactly and also internet brings me in contact with other internet music collectors. It has improved my quality of life tremendously.